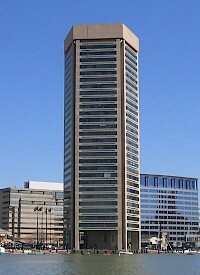 Located on the Inner Harbor of Baltimore, Maryland, the Baltimore World Trade Center is the world's tallest equilateral five-sided building (the five-sided JPMorgan Chase Tower in Houston, Texas is taller, but has unequal sides). It was designed by the firm of the famous architect I.M. Pei, with the principal architects being Henry Cobb and Pershing Wong. The building was completed in 1977 at a cost of $22 million. 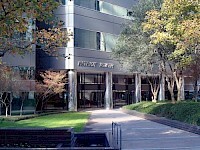 Energy Plaza is a skyscraper in the City Center District of downtown Dallas, Texas, north of Thanks-Giving Square at 1601 Bryan Street. Designed by I.M. 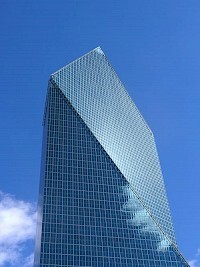 Pei and Partners, the building is 192 m (630 ft) and 49 stories, making it the ninth tallest building in Dallas. The building itself is based on a design using three triangles. Fountain Place is a 60-story late-modernist skyscraper in the Arts District in downtown Dallas, Texas. Standing at a structural height of 720 ft (220 m), it is the fifth-tallest in Dallas, and the 15th-tallest in Texas. 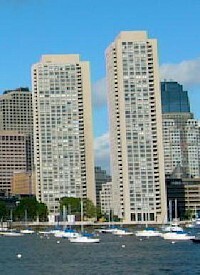 The Harbor Towers are two Brutalist-era forty-story residential towers located on the waterfront of the U.S. city of Boston, nestled between the New England Aquarium and the iconic Rowe's Wharf mixed use development. Harbor Towers I, the taller of the two towers, stands 400 feet (122 m), while Harbor Towers II rises 396 ft (121 m). 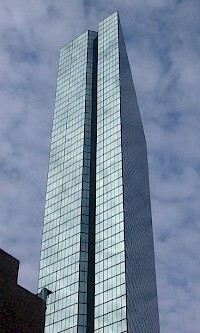 The towers are the 26th and 28th-tallest buildings in Boston, respectively. The John Hancock Tower officially named, Hancock Place and colloquially known as The Hancock, is a 60-story, 790-foot (241 m) skyscraper in Boston. The tower, the tallest in the city, was designed by Henry N. Cobb of the firm now known as Pei Cobb Freed & Partners and was completed in 1976. In 1977, the American Institute of Architects presented the firm with a National Honor Award for the building. 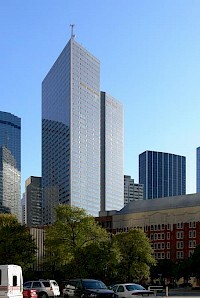 The 75-story, 1,002-foot (305 m) tall JPMorgan Chase Tower of Houston, Texas, formerly the Texas Commerce Tower, is the tallest building in Houston, the tallest building in Texas, the tallest five-sided building in the world, and is the 48th tallest building in the world. 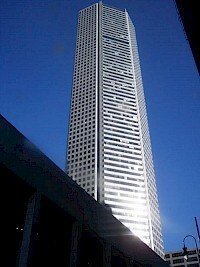 The tower was built in downtown Houston at 600 Travis Street in 1981 as the Texas Commerce Tower. It was designed by noted architects I. M. Pei & Partners. The local architect and architect of record is 3D/International. Kips Bay Towers is a large two-building condominium complex in the Kips Bay neighborhood of Manhattan with a total of 1,118 units. The complex was designed by architect I.M. Pei in the contemporary brutalist style and completed in 1963. James Ingo Freed was also involved in the design. The complex occupies an area of three city blocks, or approximately 7.5 acres, bounded by First and Second Avenues and 30th and 33d Streets. Patriot Tower (formerly One Dallas Centre) is a modernist skyscraper located in the City Center District of downtown Dallas, Texas (USA). The building rises 448 feet (137 meters). It contains 30 floors and was completed in 1979. One Dallas Center is currently tied with the Adam's Mark Hotel North Tower as the 25th-tallest building in the city. The building was originally planned as part of a three building complex designed by I.M. Pei & Partners; only one tower was constructed.